Unlike wedding gifts, which are designed to help a couple create their home together, anniversary gifts are a little trickier. Not only do you not have a registry to help guide your purchases, but you’re also likely buying gifts for a couple that already has everything they need. If you’re trying to find the perfect anniversary gift for a great couple in your life, forget about what they need and look for things that they want, but wouldn’t necessarily buy for themselves. These fun splurges can be a true delight to receive as a gift. Any couple would be happy to receive each of the following items as a way to celebrate their anniversary. More often than not, couples who like to cook up a storm in the kitchen rely on tablets or smartphones to give them recipes and conversions. However, trying to type onto a screen when your fingers are covered in cake batter is no easy feat! Make things easier for bakers and chefs by buying an engraved wooden plaque for the kitchen. 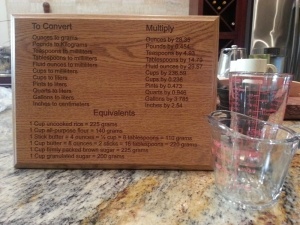 Listing out common conversions like ounces and cups to tablespoons, these plaques are certainly practical. In addition, they add to the decor of the space and can be personalized by engraving the names of the couple, their anniversary date or anything you wish. Couples who are always hosting the best cocktail parties know the value of a great cheese and crackers platter. Give them something unexpectedly delightful by choosing a personalized cheese board in a shape or style that suits their hobbies best. 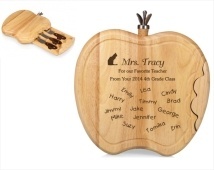 Just some of the many personalized cheese boards you can choose from include those shaped like a baseball, a casino chip, an apple, or like a bunch of grapes and there’s even one like a bag of golf clubs! The unique shapes are already a personal touch, but you can also customize the cheese boards to read “Happy Anniversary,” “5 Years!” or any other special message for the couple. Even if you have everything you might need for the home, wine lovers will never turn down a bottle of wine. 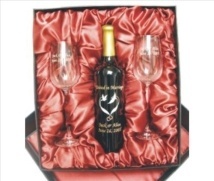 Upgrade the classic hostess gift by choosing to give a hand painted wine bottle set for a special anniversary present. The wine bottle can be engraved with your choice of picture, logo or message, and engraved wine glasses will be the perfect addition. The entire set comes packaged together in a beautiful and elegant satin-lined gift box, making it an upscale and thoughtful gift for any couple lucky enough to receive it. In a couple’s anniversary, it is common to look back with happiness and joy at the wedding day. 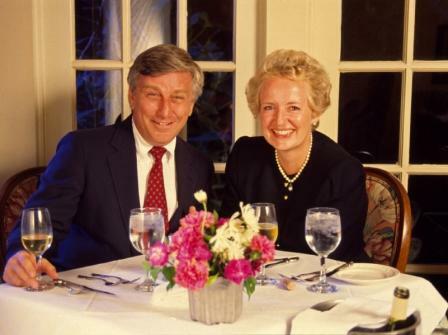 Whether the ceremony was last year or 20 years ago, many couples enjoy feeling nostalgic on their special day each year. Celebrate that nostalgia by gifting a curved glass picture frame. Engrave the names of the couple, the date of the wedding and perhaps how many years they have been together. 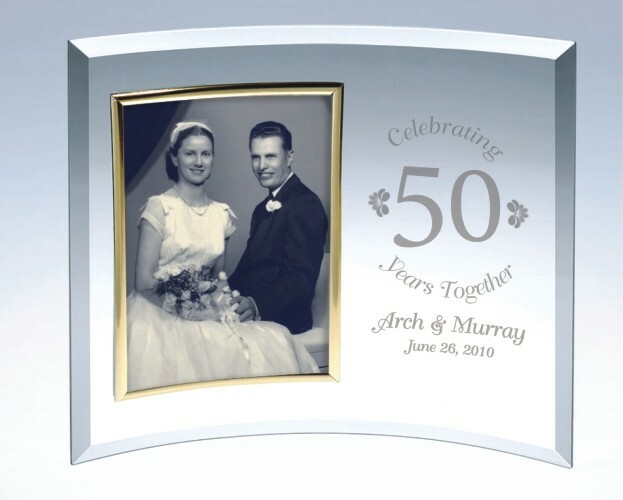 To make it even more special and personal, place a photo of the couple at their wedding into the frame before wrapping it up and presenting it to them on their anniversary. Buying the right anniversary gift for couples can feel overwhelming, especially if they already have everything they might need. Try one of these personalized and elegant gifts to show any couple that they are special and worthy of a fantastic present. Call or contact us today and we’ll help you come up with great gift ideas for that special couple celebrating their anniversary!